Northern Virginia. 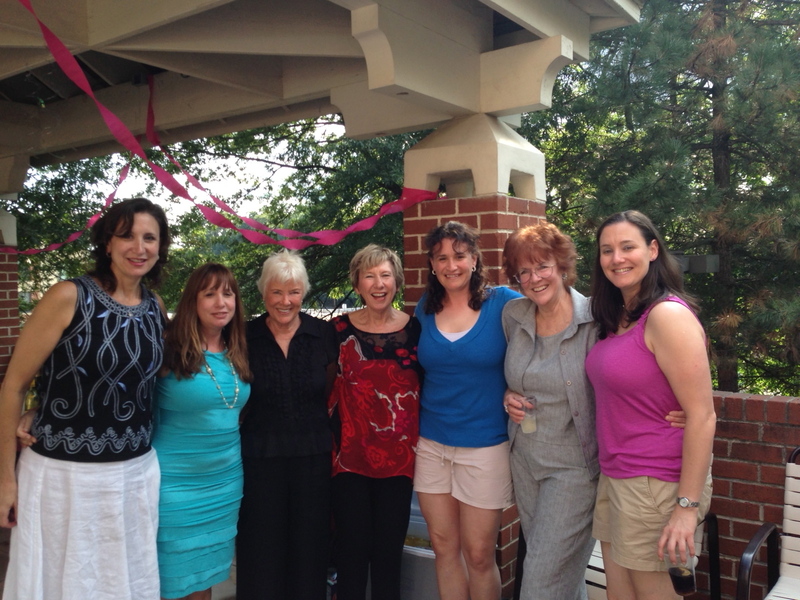 The birthday party my four girls arranged for me was WONDERFUL! :) Lots of yummy food and bunches of old friends and family talking and laughing and talking and eating and . . .you guessed it, more talking. And my granddaughter AnaSofia's 6th birthday party was lively fun and parents and family got to sit around and enjoy brats, hot dogs, & burgers and talk, talk, talk. I always enjoy meeting the families in my daughter Christine's neighborhood of Burke, VA. Great people. I promise I'll have some more photos next week. Talking late with old friends kept me up waaaay late last night so I didn't post as I usually do on Monday night. So, I want to get this up right away. This photo shows my four girls (Christine next to Melissa next to sister-friend Nancy, moi, then daughter Serena, sister-friend Diane, and youngest daughter Maria). thanks, Krista. :) We'll be cheering loudly. We're a rowdy bunch.